Arrived in Bridgman, Michigan to collab with awesome Transient Artisan Ales today. 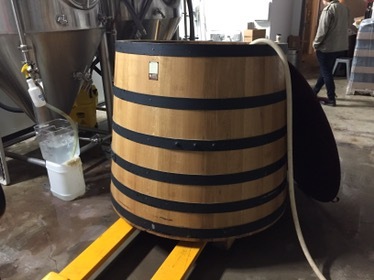 We’re brewing an old style saison which will ferment in this cute baby foeder. Can’t wait to try the end result! Tried that beer today. It was one of the most interesting beers I’ve ever had. Started off fruity and tart, with the blueberries playing the lead part. But then the finish was almost like a lingering bready-graham cracker. Reminded me of a blueberry crumble dessert. So good! Nice to hear. We haven’t tried it yet but we’re excited to try it in just a couple of weeks when Chris comes to Sweden for a beer festival.